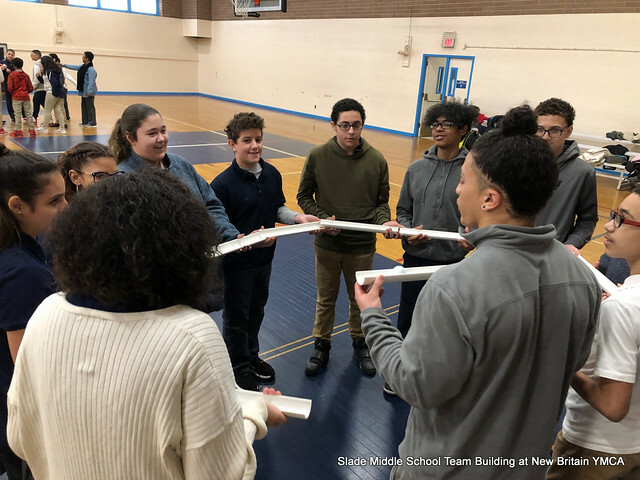 NEW BRITAIN – Local educators claim technology has impacted the interpersonal skills of students, which is why on Wednesday the New Britain YMCA hosted a group of students from Slade Middle School for a team building event. The event featured team building activities to help students communicate better, work together on group projects and build confidence to take on leadership roles. Christopher Godfrey, STEAM instructor at Slade Middle School organized the event in partnership with the YMCA. Godfrey is a former camp director at the YMCA and knows the benefits of team building activities. These team building days at the YMCA will be provided to the whole school in eight trips with eight different groups of students and teachers. On Wednesday the YMCA hosted the seventh group. Godfrey and some of the YMCA staff said that they have already started hear positive feedback from teachers in terms of the students’ classroom interaction. Students have also expressed to their teachers that they have enjoyed the activities at the YMCA. Justin Ferreira, sports director of the YMCA, organized the nine activities. The activities provided were “camp-like” and they included The Web, PVC Challenge, The Human Knot, Indoor Rock Climbing, Musical Chairs, Rock, Paper, Scissors Challenge, Birdbox Basketball, Nuke ‘Em and Giant Jump Rope. One of the games, The Web had the purpose of teaching students that they are all interconnected, that they have to work together to make sure that their rope doesn’t touch the ground or that they don’t tie it in a knot and everybody had to touch it. Superintendent of schools Nancy Sarra, was also present at the event and said that she’s glad to see that the school’s partnership with the YMCA is growing. Sarra added that these activities are important to help build a better student-teacher relationship. For photos of the Team Building event, please click on the photo below to view our YMCA photo album.